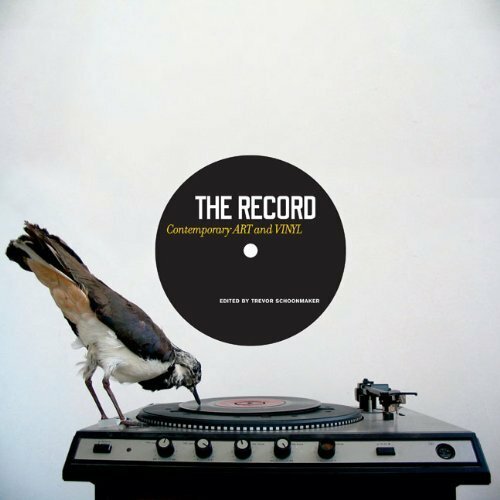 The Record: Contemporary ART and VINYL, edited by Trevor Schoonmaker (Duke University Press, 2010), is both beautifully produced and delightful to read. Meditate on the photographs of phonograph-inspired art, or on the dozen or so brief essays, which are — to a person — all interesting. No kidding. I often just skip around in a book like this. But I read The Record cover to cover. There’s a lot to learn. As is true of many amateur music collectors, I’ve amassed a fair bit of music trivia (which, in my more optimistic moments, I like to call “music knowledge”), but I didn’t know that Robert Rauschenberg created the original, limited-release cover of Talking Heads’ commercial breakthrough Speaking in Tongues (1983). Yes, accompanying Jennifer Kabat’s essay (aptly titled “New Feeling,” because that’s what it’s about), there’s a photo of the original 12-inch vinyl LP, in its transparent plastic case with colored foils. Josh Kun’s contribution begins with Thomas Edison sending Mexican president Porfiro Díaz an Edison phonograph in 1889, leading to an investigation of the “record as a medium of transnational communication” (97) — something which the Mexican Secretary of the Government made official when, in the 1970s, it ordered “that all Mexican LPS be labeled with the slogan El disco es cultura (The Record is Culture)” (98). Charles McGovern writes of record stores as communities in which “people crossed social lines […] at least for brief moments,” an experience which is vanishing as record stores close (72). 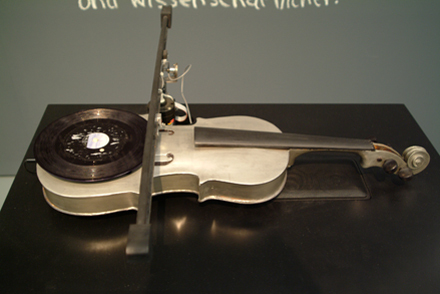 And there’s the art, such as Laurie Anderson’s “Viophonograph” (1977, shown above), which combines record and violin. Or Dario Robleto’s “Sometimes Billie Is All That Holds Me Together” (1998-99) which features buttons made from melted-down Billie Holiday records. And there’s Mingering Mike’s purely fictive album covers (1969-77). And, of course, the Jeroen Diepenmaat piece reproduced on the book’s cover. An inch-and-a-half shy of being the height and width of a record, this square coffee-table book is a pleasure to spend time with. Recommended for audiophiles, lovers of contemporary art, and anyone who likes thinking about music. If you happen to be near Duke University in the next couple of months, check out the exhibit which the book chronicles. It’s at the Nasher Museum of Art through February 6th, 2011. And, if you can’t make it there, the exhibit’s website offers much to explore. Nice to see you write about this, Phil. I just visited with my friend Trevor Schoonmaker at the Nasher Museum, who curated this exhibit and edited the book (which he was nice enough to give me).